I started working out again about a month ago to try and shed a few pounds packed on in the last six months. I’m not a big fan of working out but it’s a necessary evil if you love to eat like me! Actually, its the gyms and treadmills that I don’t like and prefer any outdoor activities. Also my trip to Argentina and Chile is fast approaching so that’s even more motivation to get in shape! Yes, I’m taking a trip soon so let me know if there are any great food places to try in Buenos Aires, or in the Santiago, Chile area. So part of the plan is to make more low or no-carb dishes for dinner. Low carb meals are so much better for your digestive system if you’re going to eat late. Try to have heavier meals during the day so you’ll have the rest of the day to use those carbs for energy. Besides, who wants to go to bed feeling full and bloated anyway? 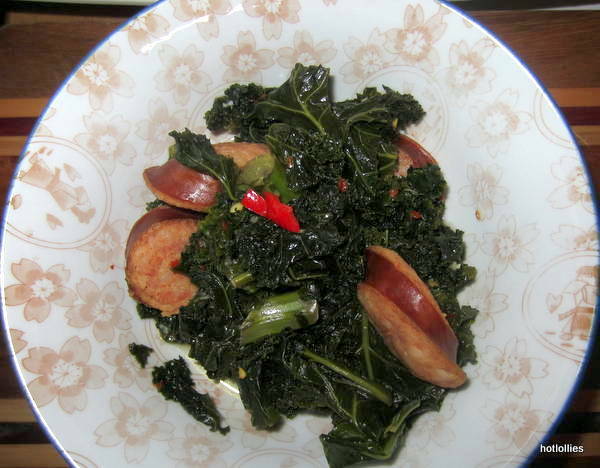 I made this spicy kale dish with turkey kielbasa because I knew it was quick and easy to make. I’m usually starving after a good workout so anything I can make under 30 minutes is fine by me. This dish may not look like much but its so filling. Kale is a hearty, leafy green that’s got a nice crunch even when cooked down a bit and the kielbasa will add the much needed protein after a tough workout. 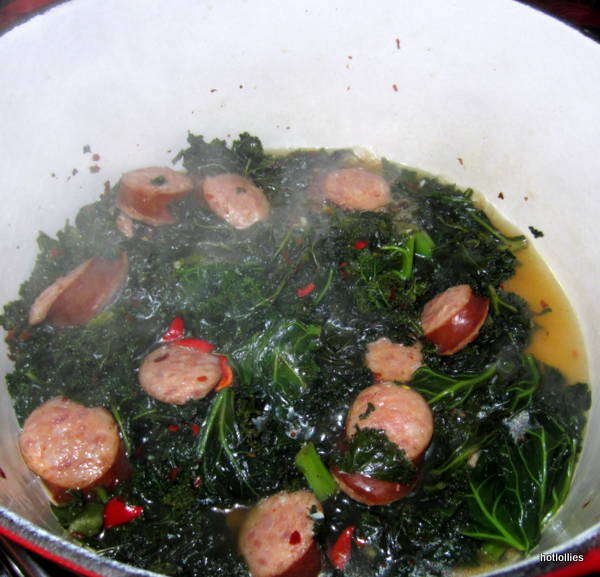 The kielbasa gives this kale a nice smokey flavor similar to what ham-hocks do for collard greens but this is a little healthier with the turkey kielbasa. The extra added spices will help boost your metabolism as well which is another benefit of spicy foods. This dish is healthy, gluten free and the kale provides disease fighting antioxidants too. Kale also packs a healthy dose of fiber, vitamin A, calcium and beta-carotene, it’s up there with broccoli as one of the super foods!! If you’ve never had it before give it a try with this easy dish. 1. Add washed and rinsed kale to an enamel pot and turn heat up to medium. Let kale sweat for a couple of minutes. 2. Add the remaining ingredients and stir well. 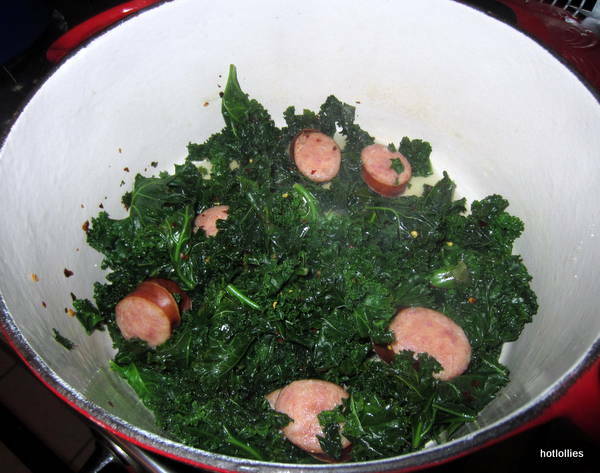 Let kielbasa and kale cook for about 10-15 minutes. You can serve this as a side dish as well, just serve a little less. Enjoy!